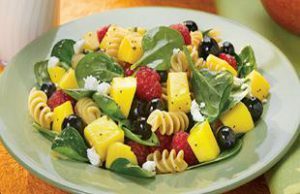 Mango, berries, spinach, and feta cheese make for a colorful twist on pasta salad, with the perfect balance of sweet and tangy. Posted in Recipes. This entry was tagged berries, diet, health, healthy, heart health, nutrition, recipe, recipes. Bookmark the permalink.